Fifteen year old Anne Arundel County resident, Tristan Mohs, has been awarded the Governor’s Individual Service Award for Youth for 2012. 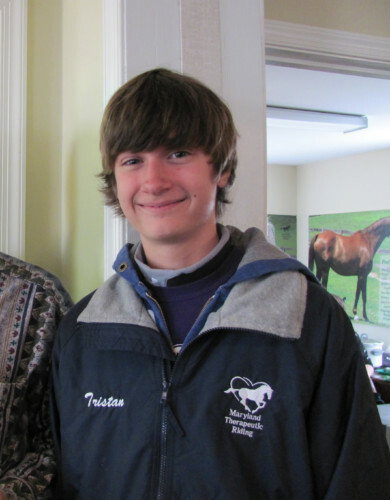 A freshman at Mount St. Joseph High School in Baltimore, and a resident of Severn, Tristan volunteers more than ten hours a week at Maryland Therapeutic Riding (MTR) in Crownsville, Maryland. Tristan is an exceptional young volunteer who often gets up at dawn on weekends to go to the barn to help. He started at MTR in November, 2010 for one hour a week looking for a fulfilling volunteer experience. His sustained commitment since then working with the special needs community helps provide a safe and effective riding experience for MTR’s riders. The Governor’s Service award will be given to Tristan at a special recognition luncheon in Baltimore on May 9th. A Governor’s Service Award recipient is selected because he or she: demonstrates sustained volunteer commitment that meets a community need; engages in meaningful volunteer service that makes a measurable difference in the community; represents extraordinary acts of generosity and kindness; and, through volunteerism, has an impact on the greater community. Tristan meets or exceeds all these criteria. A non-profit, Maryland Therapeutic Riding is located in Crownsville, Anne Arundel County, on a beautiful 25-acre farm. With the help of more than 130 volunteers each week and 11 specially-trained horses, MTR offers riding programs that offer education and healing to children and adults including those with special abilities and needs, through specially developed horseback riding programs. Founded in 1996, MTR’s year-round programs include both recreational riding, therapeutic riding and Hippotherapy which are highly structured, one-on-one therapy sessions under the guidance of an occupational, physical or speech therapist. Horses for Heroes is a free, specialty therapeutic riding program for veteran and active duty U.S. military wounded warriors and injured community-service personnel and their family members. Horses for Hope is a specialty therapeutic riding program for women going through challenges such as illness and divorce.